A new museum honoring the feats of yesterday’s air men and women and the technological achievements of Long Islanders is being created in two hangars at the former Mitchel Air Force Base. 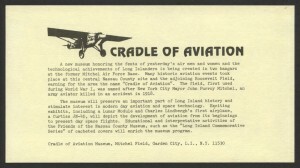 Many historic aviation events took place at this central Nassau County site and the adjoining Roosevelt Field, earning for the area the name “Cradle of Aviation”. The field, first used during World War I, was named after New York City Mayor John Purroy Mitchel, an army aviator killed in an accident in 1918. 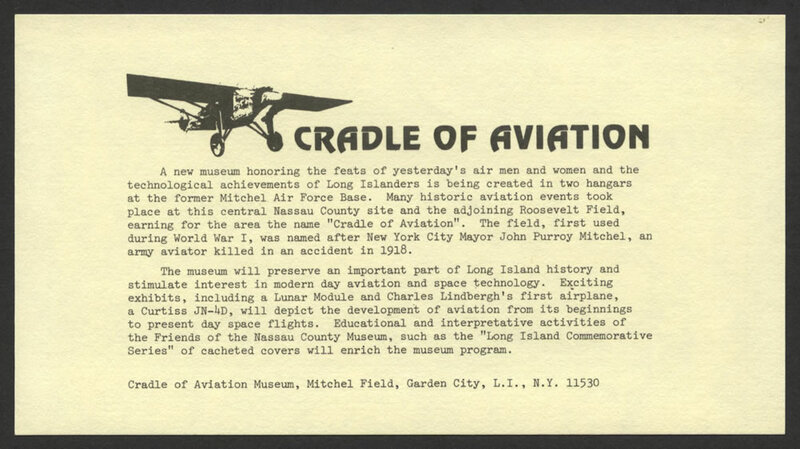 The museum will preserve an important part of Long Island history and stimulate interest in modern day aviation and space technology. Exciting exhibits, including a Lunar Module and Charles Lindbergh’s first a1rplane, a Curtiss IN-4D, will depict the development of aviation from its beginnings to present day space flights. 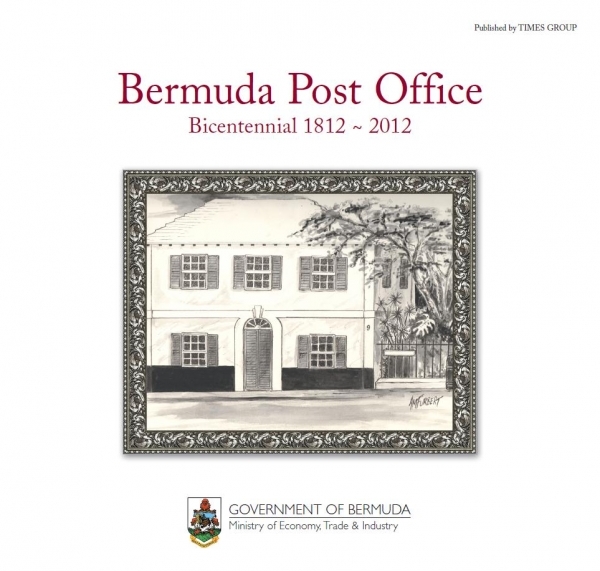 Educational and interpretative activities of the Friends of the Nassau County Museum, such as the “Long Island Commemorative Series” of cacheted covers will enrich the museum program. 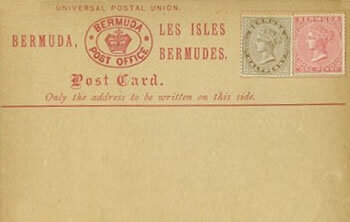 Not just a ‘stunt’, this flight proved the feasibility of airmail service to the Bermuda Islands, and in addition, was part of a survey for future trans-Atlantic flying via a route to include Bermuda to the Azores to Europe~ which was never brought to fruition because of international differences and financial problems. 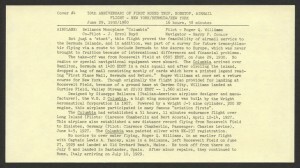 The take-off was from Roosevelt Field at 0505 EDST, on June 29, 1930. 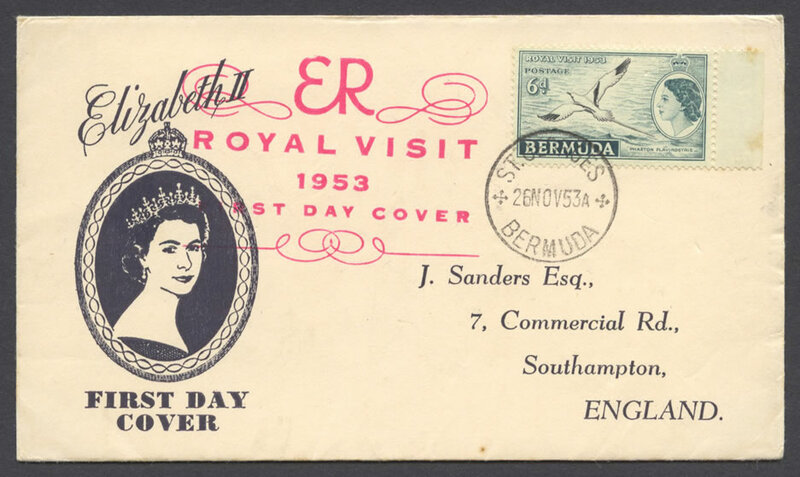 No radios or special navigational equipment were aboard. 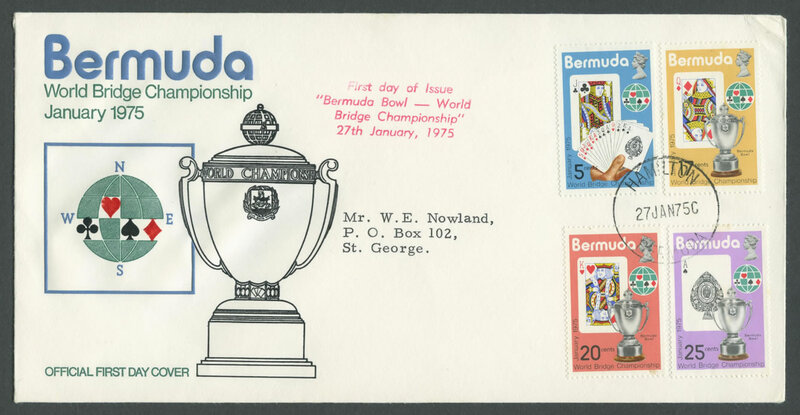 The Columbia arrived over Hamilton, Bermuda at 1420 EDST in a rain squall and after circling the island, dropped a bag of mail consisting mostly of cards which bore a printed legend reading “First Plane Mail, Bermuda and Return. lI Roger Williams at once set a return course for New York. 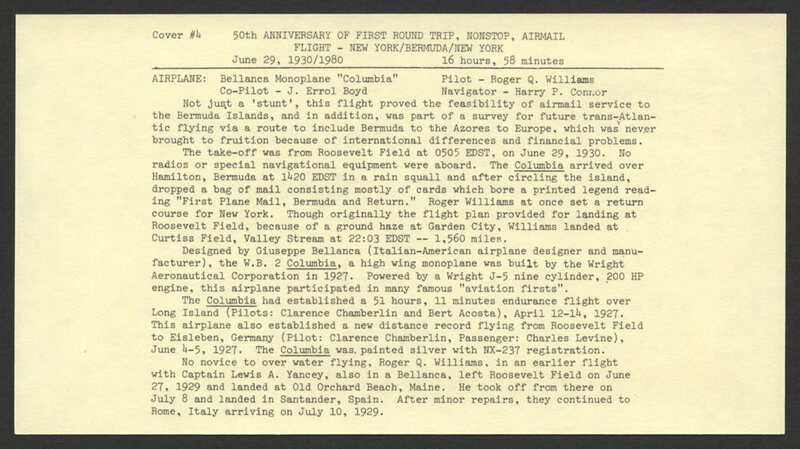 Though originally the flight plan provided for landing at Roosevelt Field, because of a ground haze at Garden City, Williams landed at Curtiss Field, Valley Stream at 22:03 EDST — 1,560 miles. 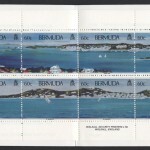 Designed by Giuseppe Bellanca (Italian-American airplane designer and manufacturer), the W.B. 2 Columbia, a high wing monoplane was built by the Wright Aeronautical Corporation in 1927. Powered by a Wright J-5 nine cylinder, 200 HP engine, this airplane participated in many famous “aviation firsts”. The Columbia had established a 51 hours, 11 minutes endurance flight over Long Island (Pilots: Clarence Chamberlin and Bert Acosta), April 12-14, 1927. This airplane also established a new distance record flying from Roosevelt Field to Eisleben, Germany (Pilot: Clarence Chamberlin, Passenger: Charles Levine), June 4-5, 1927. 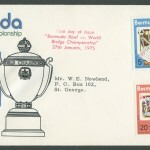 The Columbia was. painted silver with NX-237 registration. No novice to over water flying. 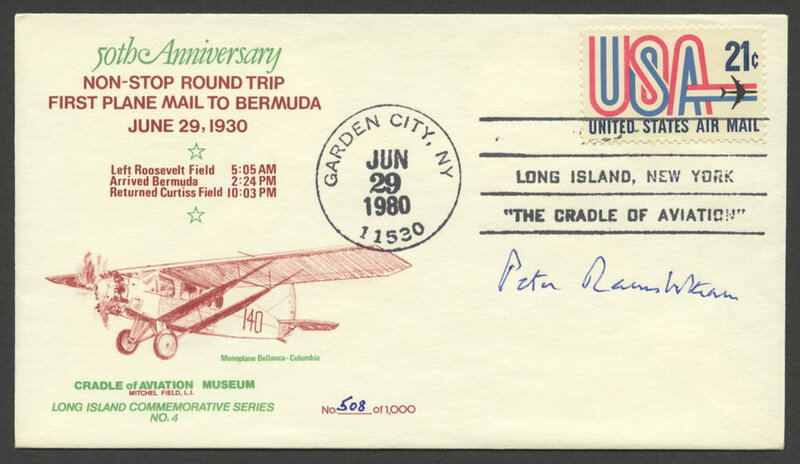 Roger Q. Williams, in an earlier flight with Captain Lewis A. Yancey, also in a Bellanca, left Roosevelt Field on June 27, 1929 and landed at Old Orchard Beach, Maine. 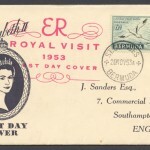 He took off from there on July 8 and landed in Santander, Spain. After minor repairs, they continued to Rome, Italy arriving on July 10, 1929. 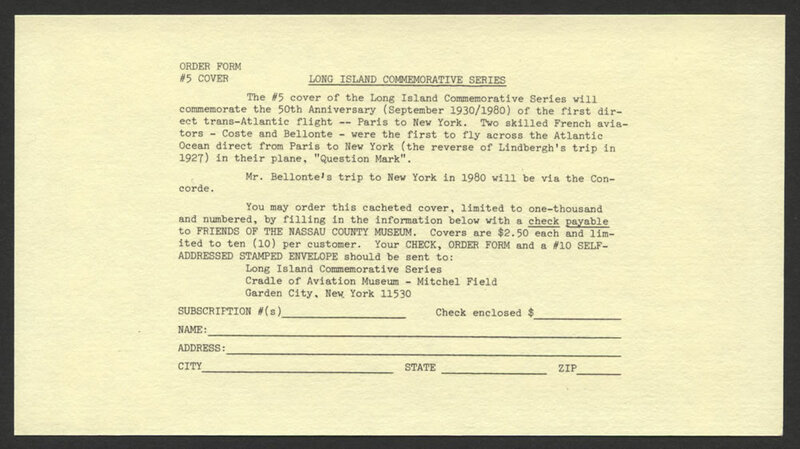 The #5 cover of the Long Island Commemorative Series will commemorate the 50th Anniversary (September 1930/1980) of the first direct trans-Atlantic flight — Paris to New York. 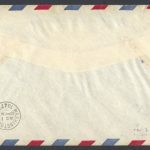 Two skilled French aviators – Coste and Bellonte – were the first to fly across the Atlantic Ocean direct from Paris to New York (the reverse of Lindbergh’s trip in 1927) in their plane, “Question Mark”. 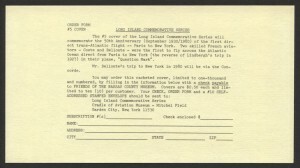 Mr. Bellonte’s trip to New York in 1980 will be via the Concorde. 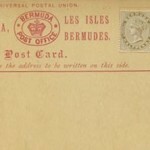 of the First Plane Mail to Bermuda and Return, he will be glad to sign them for you. 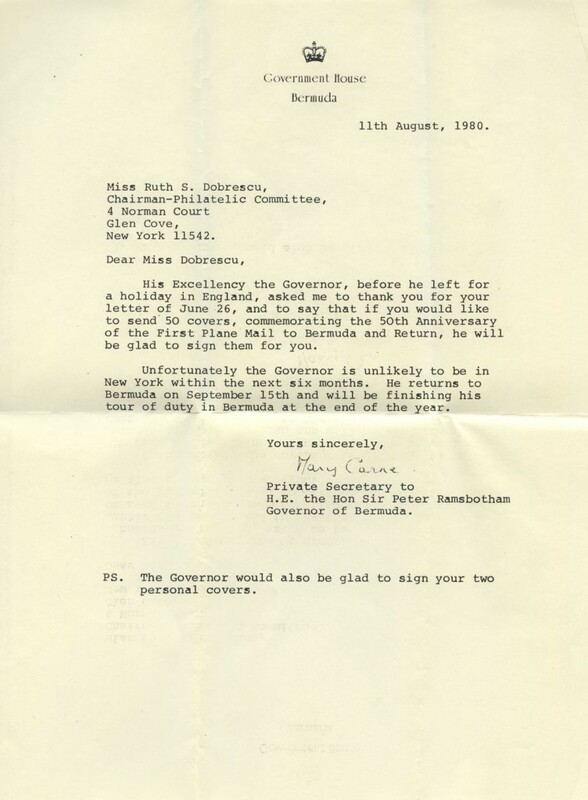 Unfortunately the Governor is unlikely to be in New York within the next six months. 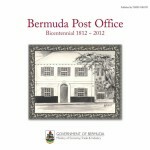 He returns to Bermuda on September 15th and will be finishing his tour of duty in Bermuda at the end of the year. PS. The Governor would also be glad to sign your two personal covers.